Tis the Columbia year to remember! Wow! September is here! Whoooo hoooo! We have a winner for our contest! Dot A. Bliss of Portland Oregon! It was so bizarro! Of all the entrants, I have fished with Dot and her friend, Bev! Congratulations, Dot! David Johnson is a great guy, and a great fisherman! Our next contest is for a winter steelhead fishing trip by Lee Darby. I just finished his web page, and I am looking forward to fishing with him myself really soon! Thanks, for donating the trip, Lee! We at ifish really have fun with these contests, and we hope to bring a few new people into your boat as a return favor! You can find Lee here. Looked at the weather forecast this morning, before heading out to the Tillamook Bay opener. The buoy forecast told me we werent going to be hanging in the jaws, but the weather looked like we could leave our rain gear behind. NOT! We went out to Barview to check out our options, and it was windy. The swells were not all that bad, but the wind would have made for a nasty day fighting to keep your boat in line. We opted for the Nehalem instead. Clancy Holt was boating a fish as we put in. The rain soon followed... That soggy, soaking-heavy-mist-with-a-light-wind soon became heavier and heavier until I finally gave in. "O.K., Bill, we can go!" Brr! It was getting chilly. A look of relief swept over his face. I hate to give up before I get a fish, but that seems to be the norm for me lately! I like to be different, you know. You guys are all haulin em in... I like to be different. No fish for me, huh uh.... Then I'd be just like you. Anyway, I'm home, warm, got a fire going, and now I'm going to bake a chocolate cake to soothe my fishless frustrations. Later, off to Tim and Shanna Juarez' for a nice bbq. Hope the weather clears! The opening of the Tillamook Bay fishery, yesterday, got off to a slow start. With swells of 6 to 8 feet, and a brisk wind, several people in boats of every size, bobbed alongside the North jetty. As Bill and I surveyed the activity from Barview, we spoke to a man who was sitting in a pickup and had been watching since daylight. He had seen no action. The Coast Guard was present, and we observed the rescue of one craft out of power and towed to safety. Can you imagine losing power, without a backup, along the crashing waves of a jetty? Yowsa! Make absolute sure you have backup power of some source! Come to find out, thankfully, as the high tide approached, action increased! Consistent reports of silver and chinook catches were reported! They are here! Wheeeeee! This is great news for the ifishstock 2001 party! We have fish! Fish for the party! I am so excited! Should be a great weekend. The tides aren't the best, but let's give it a go! Make your reservations at the Shilo at (503) 842-7971 or visit The Shilo Inn in Tillamook on the web. They are offering us a group rate of 69.00 from the usual rate of 99.00. Just mention the ifish party when making reservations. There is still room for some camping activity, here at the house. To get on the ifishstock mailing list, click here, and write ifishstock in the heading of the letter. Also, in the body, write your attendance guess as yes, no, or maybe. Not only fish are present, in Tillamook Bay, but the crabs are full, hard and plentiful also! Fish were even taken at the Oyster house! With a good rain, we might even have opportunity in the upper bay! Whooooo hoooooo! I'm going out tomorrow to collect my seafood bounty! Make certain, before you go out, that you are aware of the Marine Forecast. There are heavy swells, and a small craft advisory. We will be fishing well out of the way of these breakers, I can guarantee you. Bill is very careful of these waves and swell, but I am an absolute chicken when it comes to heavy swells. Although duct tape seems to work well to get me to be quiet about them, the best cure is to keep me away! Last nights dinner at Tim and Shanna's was abs terrific! Filled myself full of fresh crab, deep fried salmon and salads! Next week is our turn to feed ourselves sumptuously, and to meet the ifish gang! As I waited to turn across traffic on Highway 101 yesterday, I realized that this was the longest wait I had ever experienced. Lines of vacationing vehicles, as far as the eye could see in both directions. Packed with kids, and suitcases, they were traveling to one coastal destination or another. I finally was forced to switch my blinkers, turn right to join the masses until I could turn around and go the other way. From North to South, I have lived in Astoria, Warrenton, Seaside, Cannon Beach, Neahkanie Mountain, Otis, and Gleneden Beach. I'm a beach junkie. I have tried to move back to Portland, but it doesn't last long. I am called to the coast. In each coastal residence along Highway 101, I have watched the difficulty of crossing traffic on this highway increase. Labor Day is one of the busiest. This day holds a different meaning for me than most. I lived in Cannon Beach for probably 9 years, in between traveling around the country playing music. In these off times, I worked at local tourist shops. The Wine Shack, Dueber's Variety, The Lemon Tree Restaurant, amongst others. I was a tourist shop vagabond, working by day, and spending my nights eating cheeseburgers at Bill's Tavern and socializing with the winter crowds. The residential community of Cannon Beach was a close knit community, a type of organized union, that lost each other in the summer months. Some mornings, in the summer, anxious to see someone I knew, I would go to Osborne's Grocery or to The Lazy Susan to get coffee. I was rarely satisfied. If I was really desperate for local people, I would have to make a stop at the Post Office to get my "locals" fix. The "Cannon Beach Locals", fictional, but organized work force, collectively started working at 10:00 A.M., bankers/tourist hours. This allowed me to rise early, drive to the Seaside junction to get nightcrawlers, and then drive back to walk beside Elk Creek with my fishing rod before work. I had special places to sit quietly with a bobber and coffee, or walk, searching out the rise of a cutthroat trout. I could get away from the crowds. Labor Day was always especially busy. The holiday for our organized work force began the day after Labor Day. We came to look forward to this day with great anticipation. It was a reunion of sorts. The day after Labor Day signaled the start of fishing for jacks, an occasional huge salmon, and soon after, winter steelhead on the Necanicum. But most of all, rising, on the day after this big weekend, was the anticipation of driving down streets of stark quiet. The nip of Fall in the air accented the quiet, abandoned streets. No tourists, no summer cars. The familiar vehicles of people who had seemingly vanished in summer, magically reappeared! People popped their heads out of doors and walked down these abandoned streets. I would drive my car down Main Street, in Cannon Beach, with a constant wave to these lost summer hobbits, peaking out of their huts. At Osborne's Grocery, the gang gathered on the porch steps, all telling stories of the busy summer behind them. Quietly, we sipped coffee and drank in the stillness of the start of winter. Our voices echoed against the bare walls of the closed storefronts, so recently insulated with solid shopping bodies. This morning I am going to drive the kids into school. I am sure I will be able to turn left on Highway 101 with no difficulty. I will come home to the absence of the chaos of kids giggling as they spill koolaid on the kitchen floor. Stark quiet will come from the yard, instead of screaming and springs squeaking on the trampoline. The day after Labor Day on the coast. Still the same, no matter which location on the coast I choose, or what life I am fishing. For three nights now, Ginger, my newest kitty, has been missing. Every two hours or less, I am heard calling, "Here kitty, kitty" into the non responsive forest. "Chum Kitty", some know her as. (She is painted like a chum salmon). She is the one on the bottom. Jack, the other kitty seems different, needing more attention than he used to. I am worried sick and very sad. I had hope of her coming home up till yesterday. I am now thinking the worst. As the coyotes howl closer and closer to my home, I think I know what happened. The kids, and Bill and I have a new hole in our hearts. I have stopped calling "Kitty, kitty" blindly out the door. Jack, our other kitty, seems overly affectionate and needy. So am I.
I call people that I remember speaking to before that reassure me that some cats do this. They leave and come back. Ginger might too! I avoid neighbors who tell me they have also lost a cat in the last week or two, or tell me of sightings of bobcat and cougars. I called my sister last night. She told me again, of her cat that leaves for two weeks at a time. A spayed female like Ginger. I needed to hear that. She is really good at prayers, and seems to get answers and results. She knows Him really well, and sometimes I am very envious of her peace. Instead of calling and searching for Ginger, I am busying myself with party details for this weekends IFISHSTOCK 2001. I have to be rockin and rollin in the morning by 7:00 A.M. to take David into school early each day. He earned his way into a select group of musicians at his school. The Jazz Band. Although I am very proud of him, this driving 20 minutes to school each morning is one of those things that makes me as proud as it does frustrated. It's one of those things you just do as a Mother. I haven't heard the coyotes for many nights now, and I wonder if they got what they were looking for. I certainly will not be lulled to sleep by them again. More like lulled into nightmares. I got a spotlight from Costco, and I search the yard with it every night before bed. I look for coyotes, for bobcat, for anything that roams wild in the surrounding forest. Bill has a gun loaded, and although I hate guns with a passion, I'm afraid that I would let him use it, if something were threatening the chickens, or if Jack were out. I am getting hardened to living in the forest and trying to maintain my own rights as a pet and land owner. I worry for our chickens. Bill went up to the neighbors yesterday and met a man that we hadn't met or spoken to, since we moved here. He has lived here his whole life. Bill came home with gory pet stories. He spoke of challenges he has had with trying to keep chickens, cats and dogs. He gave up on chickens 10 years ago. His dogs are fenced. His cats come and go. I moved here, thinking what a wonderful place to let your animals run free! How nice, I thought, to not worry about cars running over your cats and dogs. Now I know that there is no safe place for a cat or a dog, or any domesticated animal, except behind closed doors in a house. Chickens must be securely fenced. Like Fort Knox barbed fences. Double fences, and buried fences. One half inch mesh. Wild animals carry just as much of a threat, or more, than a four wheeled vehicle in a city. I have lost two cats here. Simba, my big fluffy orange cat, and now Ginger. I still hold out a small fraction of hope that Ginger will come home, but it is a daily diminishing, whisper of a prayer. I told the boys this, and Bill was present at the time. "Perhaps God thought Ginger such a special cat that he needed her in heaven." "But we needed her more." Prayers requested for Ginger, my fishing cat... and for us! Wait a minute! I love fall! So what is up with this depressing feeling of finality? Could be the let down of the end of the Ifishstock party, but when I finished cleaning everything up, I sat down on the porch and looked out over the yard. It seemed as if I was turning summer off. The party lights came down. The hummingbird feeders came down. I cleaned the last one up, and set it in the plastic box for winter. Everything was clean, calm, and very quiet. All around me looked sad and lonely. I scanned the yard, yet again for any signs of Ginger. Will I ever stop? 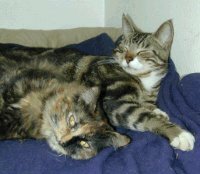 Will there ever come a closure to the loss of a pet that you have no idea what happened to her? Would I want to find a dead body? Sad. I just felt so sad! The ifishstock party was a huge success! Everyone was just great, and the food was exceptional! I think it is just a party hangover. Not from alcohol so much, but from all of the excitement. The getting ready, and then the shocking quiet of the yard afterwards. I am supposed to fish the Columbia today, but just sitting here staring at the computer and trying to catch up on my work sounds pretty good to me. Take a look at the Winners page. I was sent some really nice pictures over the weekend of some great catches! I have so many people to thank for attending the party. So many people to thank for gifts I received at the party! I have so much to say, yet I can't say it all just yet. To Michael Teague: This is one of those days we talked about, that writing doesn't come easy. It takes world terrorism to keep me off the river. I just told Captain Joe and his lovely wife Evelyn that I didn't want to be so far from my kids today. I know that sounds silly, but... that's me. We were scheduled to fish the Columbia today, and I was so excited. Up all night, half because of excitement and half because our smoke alarm kept going off for some reason. It's electric, so we couldn't turn it off! Spiders? Humidity? Frustration and little sleep. Captain Joe and his wife were all loaded up and ready to fish. I can't help but admire their efforts to go on as planned, despite the sadness and national fear. I don't suppose Tillamook Oregon is at risk, but I just feel more comfortable staying home and being there, should my kids want to come home on this day. I think, however, that they may be glad to be with their friends to distract them from all of the news and ongoing chaos. I feel pretty lonely, as Bill went ahead and joined Captain Joe on their fishing trip. It's awfully quiet here. It's beautiful out, still, peaceful and sunny. So contrary to my unsettled feelings. Dee Dee the dog and the constant news are my company. Pray for peace. Pray for the thousands of people who are afraid, hurt, families who have lost loved ones. Pray for our nation, our President, our world. Pray for the people who can't get ahold of loved ones, and rest their minds. Pray for our emergency response teams. Pray, stay calm, and maybe, just maybe, it's time to tell someone you love them. It doesn't hurt, and I'm sure it would be welcome. I slept so soundly last night. I was so worried I couldn't sleep at all, but I was emotionally exhausted, and sleep came hard and fast.. I woke with a start and a feeling that I hadn't had since I was a child. A feeling of "where am I" and "something big happened." I sat up. "Come on brain, something is up, is it good?" A dream... a surreal and terrifying dream-like event. I wanted to talk to my Mom. I wanted to sit on the couch in our old living room and commiserate with her. My Mother loved the New York skyline. My Mom is gone. So is the old New York skyline? I told her anyway, in my prayers. When I was traveling, playing piano in New York, we went downtown to see a Broadway play. "Saturday In The Park With George". I remember staring up at the buildings in awe. In fact, tears came to my eyes it was so awesome. My son David is petrified of world war. My son Andrew told me of the talk at school. "Did you know this is the first time in history that...? " "Mom, thousands of families were killed..."
I am still in disbelief and shock. Michael Teague of The Guide's Forecast gave me the gift of a lifetime. It is a small black wooden box. I found one online, if you would like to look at it. It has a little notepad where you write prayers and problems that are overwhelming you. Things that distract you from joy are written on these cards and put into the box for God to take care of. I had three cards filled out, and as I dropped them into the box, I felt a big relief come over me! One has Ginger, my lost kittie's name on it. After I dropped the "Ginger" card in the box, I sat on the back deck where David was playing the sax. The music echoed through the canyon, and I stared up at the trees. Ginger will become part of them. A huge spruce? A small huckleberry bush? Yesterday when I heard the news of this terror, I instantly thought of my God box. I finally had to pull myself away from the television yesterday. I picked up my fly rod and headed out to the river. The scene was so quiet, so peaceful, so contrary to what was going on. I was mad at the leaves that fell so gracefully from the trees. I was shocked at the innocent fluttering of moths over the still water. So natural and beautiful, they floated through the air. In my mind's eye I imagined them blowing up. How can nature go on so normal after this? I am looking at my God box now. It is so small, seemingly only big enough for my life's problems. I can't yet fill out the dainty little note card on this one. How could this enormous problem fit into that little box? Michael, do these boxes come in industrial sizes? I think our President will need one. It is that time of year again! I am late in getting this up, but please know that Tillamook Anglers is once again putting on their Annual Fishing day for kids with disabilities. This is a wonderful event to volunteer for and to participate in! Please, if you know any eligible people, let them know! We fished T bay today with no luck. Pete Morris was one of the few lucky anglers coming in with a beautiful chinook weighing in at 38 pounds! I'll post a pic soon. Have a great day, I'm off to cook dinner! The last few days I have been stuck in some kind of deep depression that I couldn't knock. A good night's sleep took away some of the hopelessness. What a relief! I tried everything I knew to knock the mood, but all looked so bleak. I practiced smiling. They say that works sometimes. It didn't. My cat is still gone. The world is in a mess. My son had his birthday party on National Mourning Day. I close my eyes and see that horrific event playing over and over on TV I think about the heroic rescue team doing an difficult and necessary job. My heart and prayers go out to all. I have never spent more time on my knees praying for the world, for the families, for our future. Our future may be a time of sacrifice. I have often mentioned that most children of today don't know the value of a dollar. They and sometimes we, don't realize how fortunate we are, and that perhaps it would take war time to help teach them. Looks like we may have to find out. To top it all off, a heart breaking event unfolded Thursday on the way home from Astoria. Twice a year or so I stop in to see my friend Don. Although I saw him most every day for 10 years, I don't know his last name. Don ran The Tolovana Park Grocery Store near Cannon Beach. I used to buy bread and milk there every day. And... Lean Cuisine's Fish Florentine for dinner. Ah, for the day's of solo dinners! Heat and Eat! We would stand outside and visit. Locals would stop by with the latest news... I would stop there first to show him my fish catch of the day. He always hugged me. He'd "ooh" and "ah" over my fish. I liked Don the store man. After I moved from Cannon Beach, I would stop by occasionally to catch up on what was new in our lives. Never... Never was there anyone else behind that store counter. I walked in two days ago and saw a different face. I stopped, feet planted in the entrance. Don must be on vacation, (Don didn't take vacations...) Don sold the store? (Don wouldn't sell the store.) Don?? "Where is Don?" I asked this strange man behind Don's familiar counter. "Don dite." He said unemotionally, casually, in what must have been a Finnish accent. I couldn't move. I needed more explanation, but I couldn't speak. Finally, "Don wha?" The store around me took on a foreign appearance. The familiarity of the shelves and the stocked food rearranged, all of the sudden sterile, out of place. Although I didn't know this man behind Don's counter, and he may very well be a nice man, I didn't like him there. I have no details. I don't know where to find details. He said Don died in January. I visited him in November. If you know what happened to Don in Tolovana, please tell me? I need closure. Bait is allowed in the Kilchis today! Just one more sign that things are looking up for fall fishing! I need, need, need good news! The water is so low out back that I am sure, should I attach a shrimp to a hook and bob it around I would only catch small resident cutts. Those are my pets, my babies. I don't like to hook them. I fly fished again last night. Although I rarely catch anything, it has become an evening tradition. I must say, I am getting pretty darn good at casting a fly. Visiting the river puts a nice closure to a busy day, and I look forward to it. The river is quiet in the evenings. It doesn't tell me the same ugly story over and over that the TV tells me inside my home. The river still knows peace and it shares that with me. In these days of uncertainty, fishing is a necessary addition to my day. Oh! And look at this! 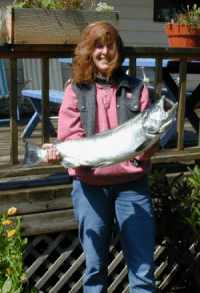 Pete's Tillamook Bay fish? Pete Morris shows us that yes indeed, Tillamook Bay is the place to be! I found out that my friend Don had some kind of very aggressive cancer and died within three months or so. Tolovana means nothing to me anymore. It used to mean Don. At dinner Bill and I were talking about it, and thought, "Gosh, what would you do if you knew you had three months to live?" It may sound morbid, but it actually was kind of like forming a Christmas list. He would buy a corvette. He would buy a new Willie Boat. 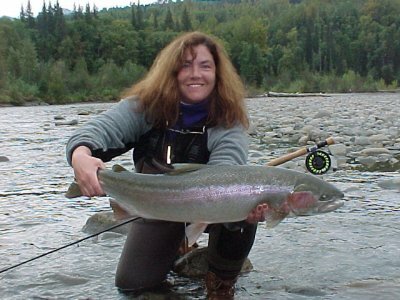 He would go to Queen Charlotte for winter steelhead. First and foremost I would take the kids to Disney World again. Spend hours floating through the water parks with a cold drink in my hand and a smile on my face. Then, I would go to Alaska and fish, fish fish fish fish! Take the kids this time. Not worry for an instant if I were stuck in a remote camp. I would hire someone to clean all my windows, inside and out. I have always wanted to do that! Never would I do laundry. I'd just buy new clothes with my credit card! I might even hire someone to clean the house. I can't see very well to clean the kitchen cupboards. I have to use one hand to feel for the grit, and one hand to clean. I worry that I don't get it all and people come to my house and see dirt that I don't see. I would surround myself with chocolate lab pups. I would write my column on ifish but not do any banners updates or new biz. The banners that are there would stay forever! "OK..." I asked Bill. "Then what are we waiting for? Why don't we live our dreams now?" Duh, I hadn't thought of that. This just in from Bob Ball of Piscatorial Pursuits! "Hip, hip, hooray. Corey caught her first steelhead on the fly today. Lost a couple of others as well :) We'll see everyone soon!" Thanks Bob and Corey!! It made my day! Steelhead on a fly... The ultimate challenge! The fish were all excited yesterday! There was a sand shrimp hatch on the Kilchis! All summer they had been giggling as I cast flies at them. I took sand shrimp yesterday. I went to the upper hole with some to tease the cutts. With barbless number 6 hooks, and 6 LB mono, I gently laid it in the riffles. A little nibble... then a huge flash in the clear depth of the pool! OHMYGOSH! It's a chinook? Not quite, but it was a nice chinook jack! I released him. Next cast... A summer steelie! In the Kilchis? Bright? WOW! I ran to get my camera, came back... and no fish anymore! Isn't that always the way? Now I have pet fishies to catch in this hole! They are there to stay, I would think, until the water comes up! I tried later to get them to bite, but I think they might be on to me. We'll see! How many of us have terrible images in our minds that we can't get rid of? The towers... The finality... The terror. This tragedy has affected my life more than I can say. Thanks to Willie, at Willie Boats for this touching tribute. Jim Erickson invited Bill and I along for a little bobber fishing on the Nehalem yesterday. I was feeling a little pressed for time, back logged on work, and almost didn't go. I am so glad I did! Thanks, Jim! Now I have to play catch up though... work... yish. In a rush, I grabbed my jar of Amerman eggs, my beautiful new GL3 bobber rod, some of Marie's shrimp scent, and headed north to Nehalem. Just as I jokingly said, "No man can get me into a salmon...", it happened! It was a nice jack, quick-released at the boat. Shortly after, "Whooooo hooooo!" The big takedown! My bobber went down with a plunge! This was a real salmon! We had to chase after it. Up went the anchor and soon I landed a nice 14 lb buck. Man, did that fish have energy! I was making alot of excited racket amongst the otherwise quiet boat lined stream. "I have never kissed anyone's *** for eggs before, but I'm about ready to!" I heard the grumble from the back of the boat. "UH OH!" Fish on again! Down went the bobber, and a hen, about the same size as my buck gave me another fun fight. It came loose right at the boat. Darn! They both joked that I was using enough eggs to choke the fish, that they were going to throw me in, but hey, what the heck? I was catching fish! 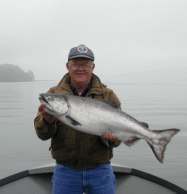 Bill boated a nice 22 inch chinook jack, after losing another one earlier. We filleted and deep fried the jack for dinner. Yum! We picked up to do a little spinner fishing. The heavy incoming tide produced weeds and a dark water color, which prevented much action on spinners. We headed in for the day. Fish are spread through the entire Nehalem system. Although rough bar conditions are keeping people from fishing the bar, that is where I'd like to be. It's just too dangerous out there, with breakers breaking, even on the north side of the South Jetty. It was so pleasant to sit in the quiet waters with fish leaping and splashing all around us. I just love to bobber fish! The river is extremely crowded this year. It's no secret that the Nehalem is producing. Tillamook Bay, the ghost hole, and Memaloose are producing salmon and silvers, according to reports from ifish guide, Marty Peterson. I think Friday I'll give the old home waters a try. Buoy 10 has been a bit of a disappointment. Did we catch them all? I am hoarding, but can't wait to try the absolutely gorgeous, deep-red chinook eggs from Marie at Tillamook Bait! I went to visit the shop not too long ago, and she had tray after tray of beautiful eggs spread out all around her! How could a girl resist? If you are bobber fishing with eggs, don't forget to take along some of Marie's special shrimp scent. I wouldn't be caught fishing without it! I think I need one bottle for my steelhead bag, one for my salmon box, one for my vest, one for my purse, and of course, one for my car. How many girls do you know that have herring scales on her wallet and corkies in her change purse? Work day for me here. Get out there and fish! It's a great time to hire a guide or a charter. Take your wife, take your kids! This is the salmon year to savor, and it's not going to last forever! The db is down, due to technical overload! Please be patient as the powers that be upgrade me and help us to get back online! They said 15 minutes. Can you make it, or should we have withdrawal meetings? Go to chat if you are suffering ifish withdrawals. We are back up and running smoothly. Thanks for your patience. Bill hooked into a sockeye out back in the Kilchis! That's pretty rare! I'm going to miss long summer evenings, fishing out back. Not so much because of the weather. Not so much because of any good fishing. Definitely not because of the quiet. I am going to miss the haunting and beautiful resonance of David's saxophone echoing off the canyon walls of the Kilchis River. I wonder, if I could talk him into playing outside in winter, if the acoustics would be the same. I wonder how the absence of the lush foliage on the trees would affect the resonance. Every time a leave falls onto the river I listen for a change in tone. Every time I move from one hole to another, I listen for a change in tone. Besides it being louder or softer, as I grow closer or further away from him, it remains the same. Beautiful, peaceful, mournful. The alto sax. Time is rushed, lately, as I try to fill my days with activities that keep my mind occupied with things other than war. David likes to have me listen to him play. I know that he would probably prefer me to sit down and listen to him one on one. He knows, however, that as I fish, I am listening. I told him once how beautiful it was to hear him play as I fish. That's all it took. Every time he gets home from school now and sees that I am out flipping flies, he grabs his sax. He knows that I am listening. We have a big bell outside to call people in for dinner. The saxophone does a much better job. David calls me in, and I walk up the path from the river and see him standing there, filling the world with his music. I make it to the porch, fly rod in hand, and sit down to listen, one on one. We are both still and quiet, except for his music. I look up at the tops of the hillsides, covered with green. I hear a heron squawk as it makes a nightly trek down the river. My mind and my ears are full. I'm going to have to get David some gloves for winter. Salmon and steelhead season is coming, and I have just got to find out what his sax will sound like against the cold, icy evenings of fall. 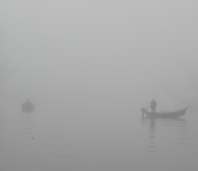 Bobber fishing in the early morning fog, on the Nehalem river. I fish for peace and quiet. I fish for relaxation, for the beauty, for the get away! Bobber fishing in quiet streams is my passion. Walking along in the woods, flipping flies into the song of a stream is my peace. Then why the heck do I want to endure trying to stand, with my marfan affected, wimpy connective tissue, in six to seven foot swells out in T bay? We slapped high fives like joyous pirates at sea! The waves crashed onto the rocks of the jetty to join in applause! The salt water gave in to us! Chinook fishing on Tillamook Bay, along the jetty. This pic was taken in calmer waters! This fish comes with a price. My legs hurt! My head has a huge bump on it! I can't say that I don't get a little frightened, either. While netting it, I had one leg wedged against the gunwale and my body balanced against the steering column. The 10 ounce weight, necessary for fishing in the outgoing current, slammed me in the head. ARGH! Short nets can kill! "Get that weight out of my face!" It swung back and fourth like a torturous pendulum, keeping time with the ocean sway. I swooped in at the weights mid swing and successfully scooped him! He's beautiful, yes! He's magnificent, yes! But... I hurt now! I would seldom tire of bobber fishing the same river, day after day. At seasons end, I believe my catch rate would be close to those who constantly hunt. Those who move from river to river, from ocean jetty to bay, from bobber to spinner to herring and back. Patience, and peace and quiet are gained, and much time saved while others travel, re rig, pull anchor, run, trade reports on the cb and chase. I've got to say, it's all fun, and I'll keep both. The things I have learned while chasing add to my knowledge base while sitting. And sit I will. I have no choice today. I can't move! You know what is abs awesome? Truly inspiring? A lovely thought? Today has GOT to be better than yesterday! Wheeeeeeee! I picked up the kids from school last night and took them to get their hair cut. Women go to the salon to get their hair done. It's something they mark on the calendar. A day they know that will make them happy. A feel good thing! A special day that you feel new, pretty, and pampered. There is nothing greater than a new 'doo'! To save time, I had the boys appointment made the same time as mine. I don't have a little girl. I never had the experience of braiding a little girls hair or struggling to get barrettes to stick in their shiny, slippery locks. I always wanted to do just that! There is a bit of a role reversal in our family. My boys grew up in their younger years with a Mom that is an avid fisher woman. Their Father, a chef. Andrew was three years old when the fact that something in our family was not traditional hit hard. He was playing house with a little girl from the church. They were surrounded by a little plastic kitchenette, complete with dishes and food. He put his arm around that little girl and spoke to her very seriously. "Honey, you go out and catch some fish, and I'll stay home and clean house." So... it was with herring scales stuck to my wallet, and a bit of leader hanging out of my change purse that I walked into the salon. My boys were stylish, dressed in all the latest fashion clothes. I, in jeans and mud shoes. Andrew was first. The 'stylist' put Andrew into a very fashionable guy cut when Andrew spied the latest of all fashion statements. Something I swore my kids would never do. Something I thought showed signs of rebellion, 'new age' kids I'd seen hanging out at Pioneer Square in downtown Portland. A tube of blue hair color. A tube of blue. A tube of yellow. A tube of green. "Want to?" The stylist questioned with glee. Andrew's eyes glossed over as he half heartedly sought my approval. "It washes out in one shampoo". "YES!" he agreed, and I, shocked at myself, giggled in approval! Andrew walked out of that salon looking as if he had been finger painting with Kindergartners all day long. He was brilliant, and stylish and new! Spikes of all colors radiated from his head. David's hair was spiked up and short, tipped with blue and iridescent silver. He radiated the color of my favorite Blue Pirate fishing lure! I proceeded to get my hair cut. It was cut. It was the same as yesterday, but a bit shorter. No blue for me. No yellow. Just shorter. As I walked out of that salon, I stared at my boys and I realized who was feeling new, and it wasn't me! They were different, fashionable and modern! They were young. I guess there will always be a little role reversal in our family, and hey, why not? At least this statement washed out last night. But I tell you one thing, and this is for absolute certain. I made a manicure and pedicure appointment, and dangit, I'm going alone!!! Thank you to Tackle4Less for awarding ifish the seal of excellence! That made me smile! I have been sick lately. I am blaming it on stress. How else can I explain being sick three times this month? First, pneumonia, then twice sinus and ear infections? Argh! I have lost 4 pets in two years. Hershey, my 14 year old lab, Simba, my fluffy orange cat, Ginger, my one year old stray, and Chickee Baby, my favorite chicken. It's been a rough couple of years. So, it is with fondness, that I fell asleep on the couch with the newest addition to our family. A sick, fragile little thing found by the kids bus driver. This cat has a purring motor that starts up as soon as you reach for him. With blurry, infected eyes, and a matted coat, you can't help but love him! We've yet to name him. All we know is that he needs us. Off I go to church, weighted down with vac packs of smoked salmon to share with the congregation. A new kitty and something to give away to make people smile. I'll be well in no time.